Once upon a time Pete the Potato met his best friend Spaghettio the Mafia boss who was working at the Couch Potato Company. Pete’s greatest wish was to join this company and finally he had a chance. Spaghettio came with Pete Potato to the interview, but on his way in he fell on his face and smashed a window which caused him to go back in time. When he was back in time he met young Spaghettio coming out of his interview and said “Yo how’s it going Spaghettio?”, “Please don’t eat me” shouted Spaghettio. 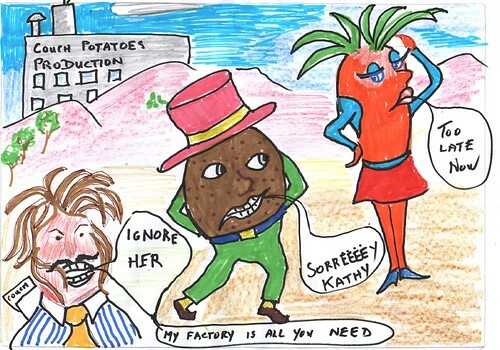 Then Pete the Potato looked behind him and saw his younger self as a seed with his ex girlfriend, Cathy the Carrot.